As schools have focused more on testing, math, and science, other groups have come forward to nurture kids’ creativity. Published on Monday, December 12, 2016. This article appears in the December/January 2017 issue of American Craft Magazine. The Learning and Achieving Through the Arts program develops skills in the visual arts. Art implants a “curiosity that will last a lifetime,” Inner-City Arts co-founder Bob Bates says. It’s no secret that the arts are disappearing from American classrooms. In today’s high-stakes testing culture, public schools are under pressure to devote instruction time to subjects deemed more important, such as math and science. Many argue, however, that the decline of K–12 arts education does a disservice to schoolchildren, and not just those with an artistic bent. Research (and everyday experience) suggests that art makes us happier, less stressed, more productive. James Catterall’s landmark 2009 study, Doing Well and Doing Good by Doing Art, strongly connected arts learning with both academic success and social engagement, especially for low-income students. And lately creativity is being tied to innovative thinking across disciplines: The STEM-to-STEAM movement calls for adding arts to an integrated curriculum of science, technology, engineering, and math. As the National Art Education Association asserts, “to be successful in STEM-related career fields, students must be proficient in visual thinking and creative problem-solving facilitated by a strong visual art education.” In other words, art makes us smart. So if evidence points to the benefits of art education, but schools are short on time and money, how do we get it to kids in a substantive way? Dedicated organizations and individuals are stepping up with various solutions to fill the gap. Here, we highlight a few inspiring models. In 1989, with help from businessman and arts patron Irwin Jaeger, Bates heeded that mystical call and founded Inner-City Arts in a small space downtown. 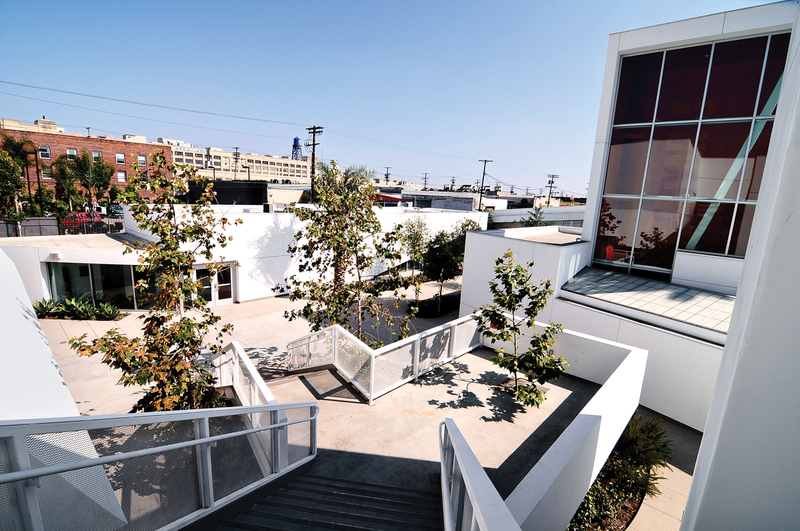 Today it’s a vibrant complex of sleek studio buildings designed by architect Michael Maltzan, an urban oasis of beauty, safety, and creativity, right next to Skid Row. 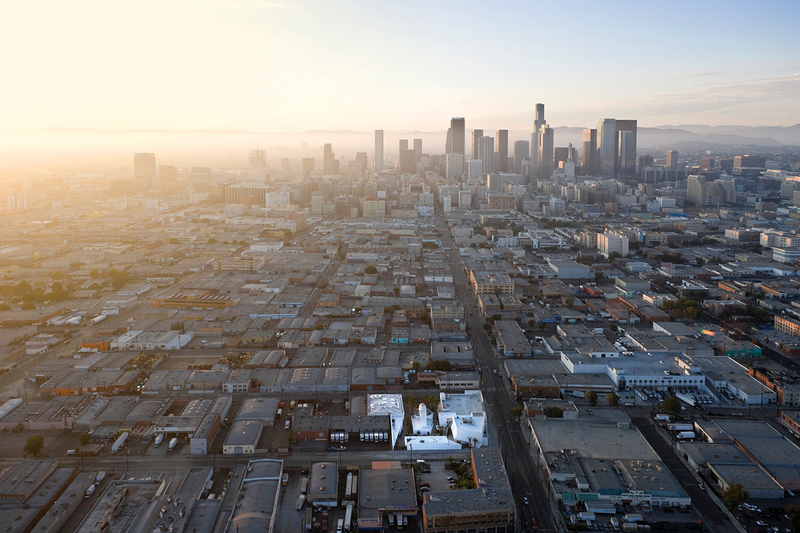 There, thousands of mostly Latino and African American children and teenagers from some of LA’s poorest neighborhoods – most of whom receive little or no art instruction in school – can access first-rate facilities in visual, performing, and media arts. 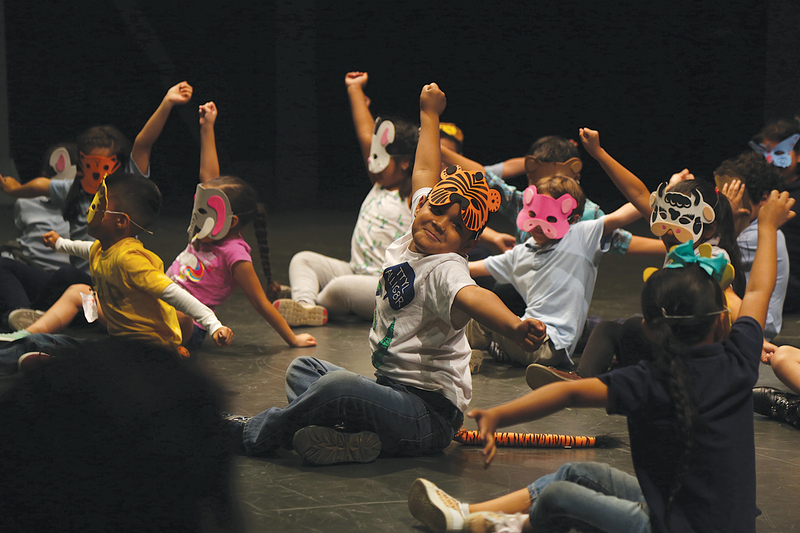 Through a partnership with the Los Angeles Unified School District, K–8 students and their classroom teachers are brought to Inner-City Arts twice a week for seven-week sessions. Middle and high schoolers can get scholarships to take after-school and weekend workshops in everything from painting and ceramics to dance and digital design. And teachers come for professional development, to learn how the arts can be a bridge to academic success, especially in high-poverty schools. For Bates, the place and its programs serve both a practical need and a higher purpose. “In the beginning, I thought art was about a good experience making cool things,” he says. “But over the years I’ve observed that art is the major tool for opening the possibilities of invention, creation, exploration. Once that switch is thrown, people have a curiosity that will last a lifetime. They will solve problems, work in teams, do things” – and maybe, he hopes, become “more human, compassionate, and merciful” along the way. Residents of Lawrence, Kansas, pride themselves on their small city’s big cultural life: the University of Kansas and its art museum, the little theater troupes, the popular downtown gallery walks on the last Friday of every month, the exceptionally strong art programs in the public schools. To top it off, there’s the Lawrence Arts Center, a 40,000-square-foot facility that offers exhibitions, performances, and a diverse program of year-round art education, including a unique arts-based preschool and kindergarten. “One thing I try to infuse into our programming is the power of imagination – believing in possibility, pushing yourself to do things that are grand,” says Neal Barbour, the center’s director of youth education for first through 12th grades. A printmaker and ceramist, Barbour came to Lawrence from the Northwest five years ago (after his job as a school art teacher was cut), with a mandate to develop a STEAM curriculum at the center. He convened a group of artists and scientists to look at science, technology, engineering, and math subjects through an arts lens, which led to some 200 lesson plans now taught in the center’s well-equipped studios. One class examines the science of camera shutter speed through the “light drawings” Picasso created with a Life magazine photographer in 1949. In another, students engineer robots that move through the force of vibration, drawing pictures with their feet. “Kids, art, play – they all go together,” says Barbour’s colleague Linda Reimond, the founder and longtime director of the center’s arts-based preschool, recently named in her honor. Reimond was an early childhood teacher and had a toddler at home when she started the school in 1985, with a class of 18 pupils. With about 120 preschoolers enrolled today, the school inspires children ages 3 to 5 to learn through music, movement, storytelling, and hands-on making. “We let them discover,” says Reimond. “A child at the easel will mix a blue and a yellow and then gasp – ‘I made green!’ ” Each classroom has a Creation Station, where little hands go wild concocting objects out of old CDs, paper-towel tubes, all manner of household junk. “Houses, rockets, robots – whatever they imagine, they have to figure out, make those parts fit together. Well, that’s science, engineering, and math. They tell stories about what they’ve made, we write them down, they point to the words, and – oh gosh, that’s reading.” The arts open the door to academic skills. For her work developing this approach, Reimond was one of 10 winners of the Henry Ford Teacher Innovator Award in 2015. In Detroit for the ceremony, she toured the nearby Ford plant. “We were looking at F-150 trucks being made on an assembly line by all these computers and robots,” she recalls. “Suddenly it hit me: In 20 years, no job will look the same as it does now. So what life skills can we give the kids we’re teaching now?” She came up with five essentials: problem solving, creative thinking, communication, teamwork, and social skills – “Those are the things kids need.” And early exposure to the wonders of art is important grounding. Caitlin Kannapell and Rachel Mauser believe in taking art to the people. Since launching a nonprofit community maker space called the Steam Exchange, they’ve become fixtures around the Smoketown neighborhood of Louisville, Kentucky. They chat up residents on the street, urging them to come take classes or enjoy open studio time. Sometimes, to draw folks in, they wheel out the hot-dog cart they converted into a mobile screen-printing studio. All ages are welcome, but Kannapell and Mauser are especially determined to engage local youth. “Rachel and I have a huge amount of respect for young people. We love, love, love kids,” says Kannapell. “Making sure they have a voice, feel respected, and understand their true capacity is really important to us.” At Steam Exchange headquarters (a former liquor store the women fixed up with help from neighbors), children and young adults can take free classes, some approaching STEM subjects through creativity, others simply art for art’s sake. Middle schoolers and teens from the neighborhood can also serve on a Youth Vision committee to plan their own projects in the community – a mural, for instance – and take part in public events. 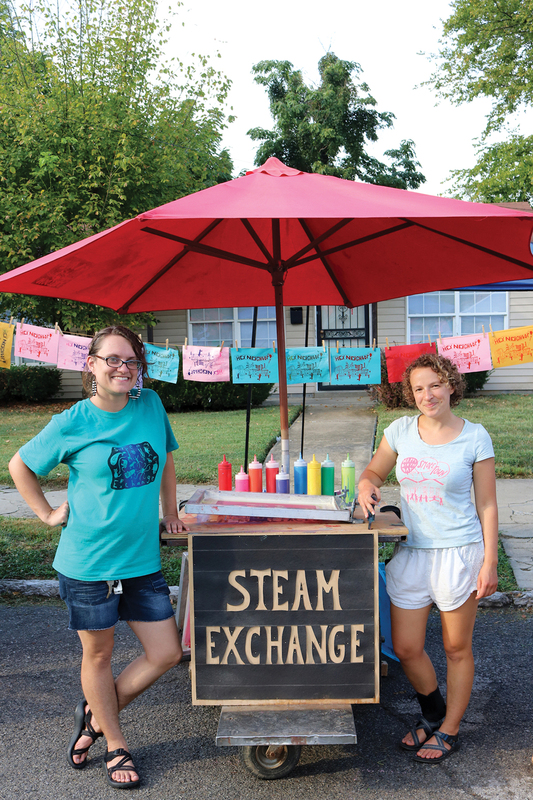 The two friends were each looking for a meaningful way to promote artmaking at the grass roots when they teamed up to start the Steam Exchange in 2014. Kannapell had a math degree and had taught various academic subjects in non-traditional learning environments. Mauser, an artist and bookbinder, had just finished a fellowship at Penland School of Crafts. They decided to focus on Smoketown, the oldest historically African American neighborhood in Louisville, named for the kilns of its old days as a brickmaking hub. With startup money from IDEAS 40203 (an artist-led group promoting creative entrepreneurship) and YouthBuild Louisville, “we went for it,” says Mauser. First, though, they talked to people on the ground. At Kidspace, a child-centered gallery in the Massachusetts Museum of Contemporary Art, art is changing lives. “Kidspace is about showing how art isn’t a separate category of our lives, but part of our everyday experience,” says director of education Laura Thompson. 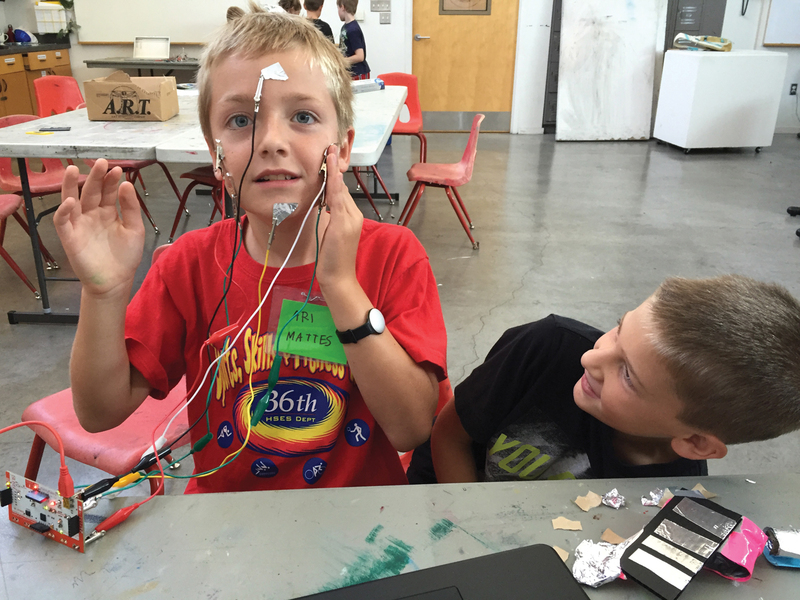 “It’s a vehicle that people can use to communicate, to problem-solve challenges in their everyday lives.” The museum’s community program, Art 4 Change, engages children through art to promote empathy, optimism, and courage – qualities Thompson thinks are essential to tackling today’s problems. At Kidspace, art sparks conversations about social issues that affect many children, their families, and their neighborhoods, as well as society at large. Now through spring, two concurrent exhibitions light up Kidspace and animate the principles that A4C seeks to advance. In the show “Here Comes the Sun,” Federico Uribe’s On Good Faith playfully summons visitors to examine the sculpture’s form (a lion), materials, and meanings. His meticulously assembled sculpture of brass bullet casings, shotgun shells, plastic flowers, and feathers uses beauty and intrigue to explore violence, among other subjects. Nick Cave’s “Kaleidoscopic Playground” riffs on the optical repetition and symmetrical patterns that kaleidoscopes create, surrounding visitors in a colorful, fun-house-like environment. Mirrored silhouettes of children cast visitors’ reflections, appearing with word prompts such as “special,” “other,” “until,” or “as is.” The words invite visitors to use personal experience and knowledge to create their own meaning and insight. With these lighthearted works, the artists encourage guests not to succumb to the fear, anger, and hopelessness that violence, racial strife, homelessness, and hunger can bring. Instead, they appeal to visitors to take the optimism and joy they find at Kidspace and use it as fuel to achieve their potential and lift up others. A former museum administrator, Mark Richard Leach writes about visual arts and is an independent curator and consultant. He lives near Charlotte, North Carolina. At Lawrence Arts Center, Ari Mattes built a musical instrument using a simple circuit board; by grounding the wires to his face, he becomes part of the instrument. 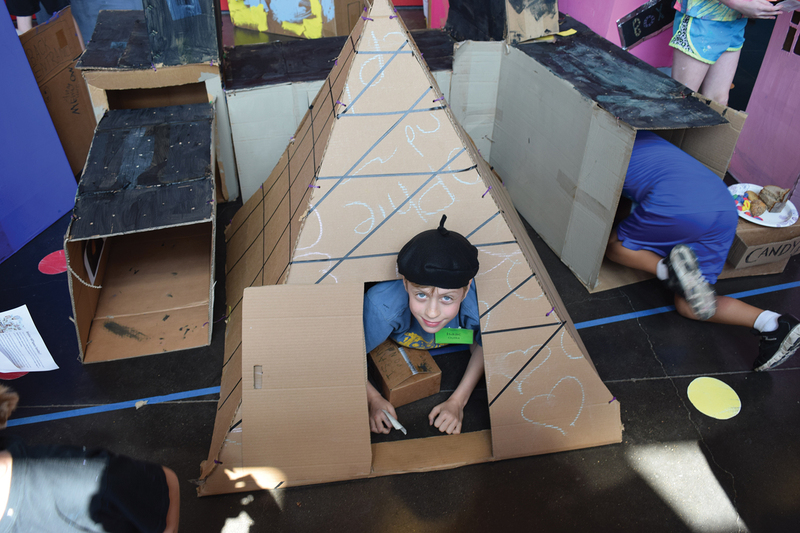 In the heart of downtown LA, Inner-City Arts provides art education for children and teens living in some of the city’s poorest neighborhoods. By partnering with the school district, the center brings students in for classes that develop creative thinking, as well as providing professional development for teachers. Inner-City Arts' urban complex was designed by architect Michael Maltzan. Each Inner-City Arts session ends with a student performance, attended by teachers and administrators, family and friends. 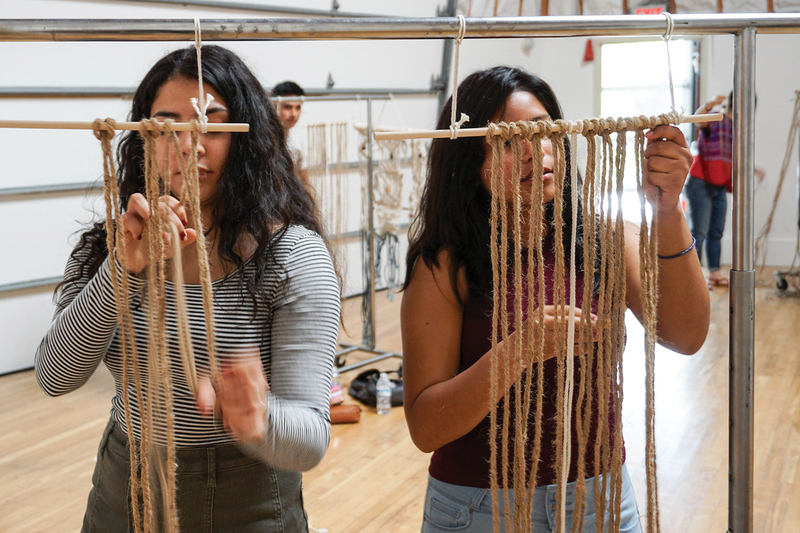 Students in this fibers workshop learn a meditative approach to macramé skills. 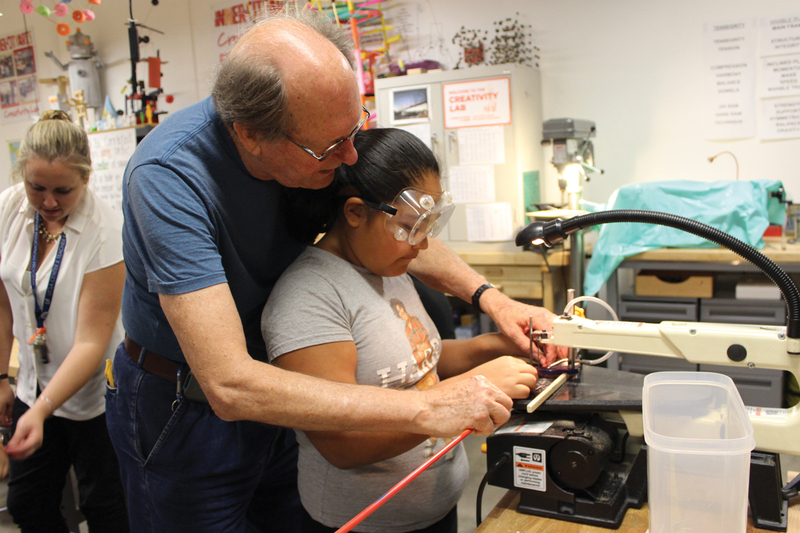 Bates helps a student in the Creativity Lab, where kids learn how to design and make their own machines, combining art and science. 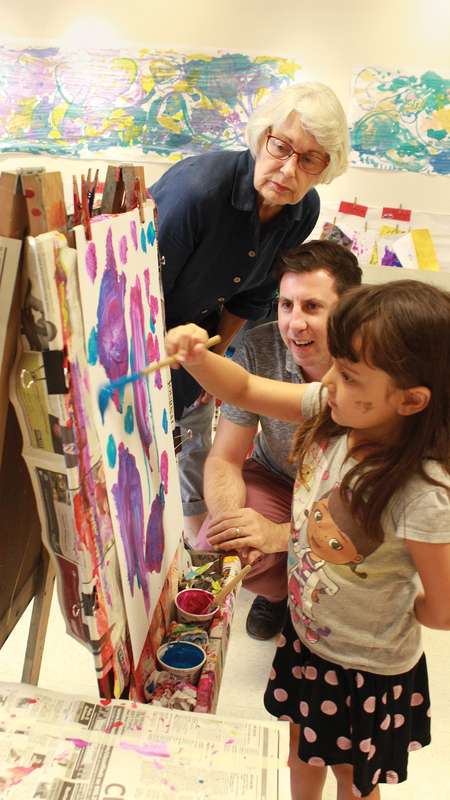 Preschool director Linda Reimond (top) and youth education director Neal Barbour (center) watch as a student in the arts-based preschool paints. 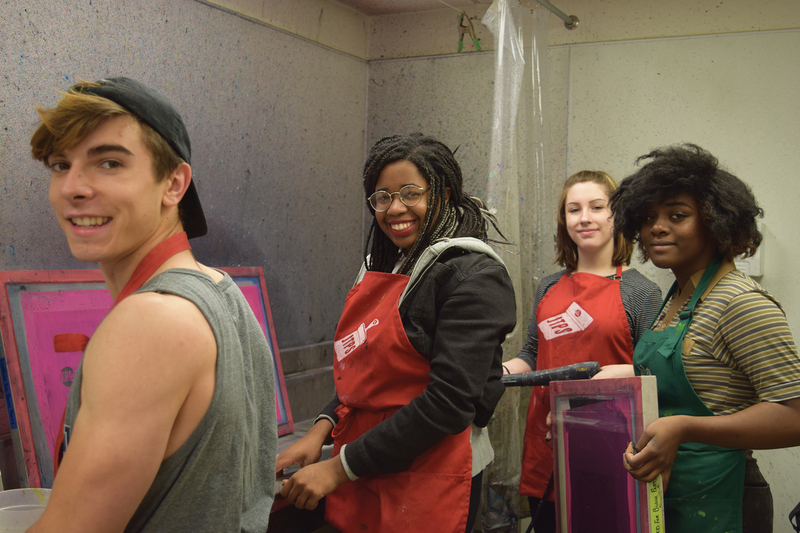 High school students screenprint promotional T-shirts for their curatorial group, which puts on monthly gallery shows. 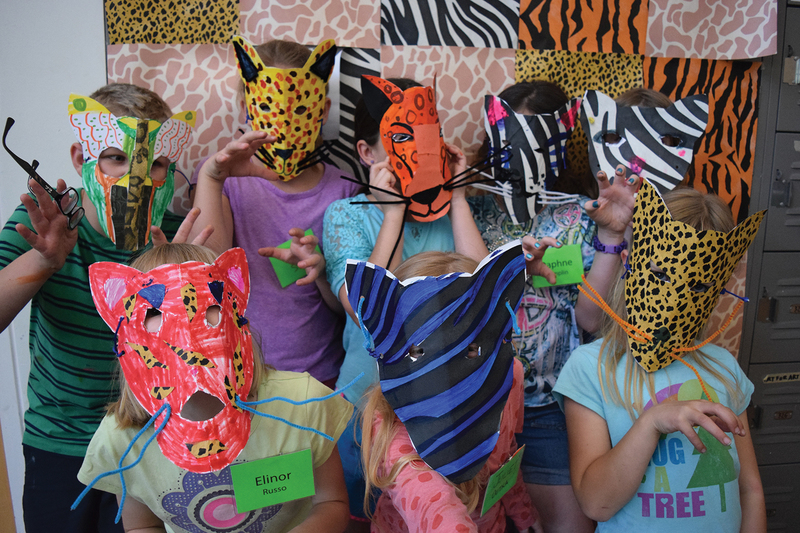 This camp, with an African wildlife theme, combined principles of color and harmony with biodiversity and ecosystems. 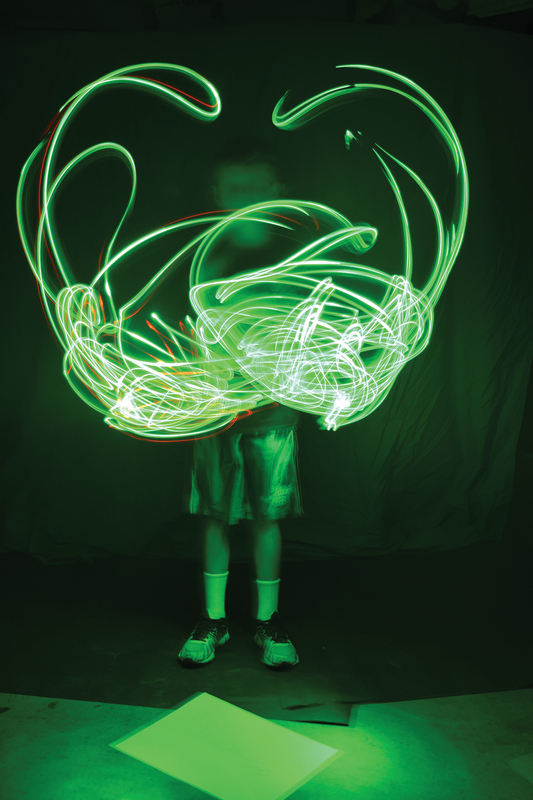 Inspired by Picasso, a fourth-grader first practiced a continuous line drawing on paper before bringing it to life with the help of LED lights and a camera set to a slow shutter speed. 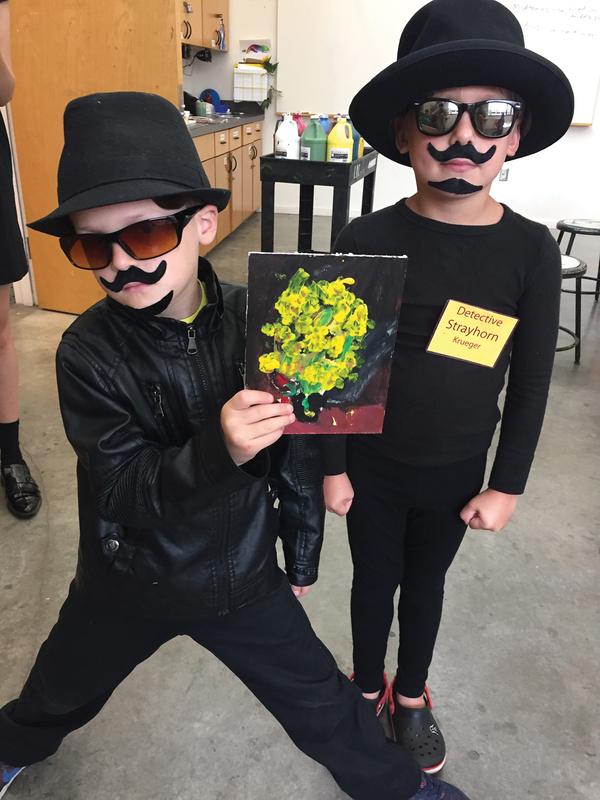 At Art Detectives camp, third-graders solve a painting theft using practices grounded in forensic science. Isaac Outka peers out of his cardboard replica of the Louvre, which features several of the museum’s most famous paintings in miniature. He made the structure during an urban planning and architecture camp. Caitlin Kannapell (left) and Rachel Mauser with their mobile screenprinting cart. The duo’s nonprofit space serves as a community art incubator. 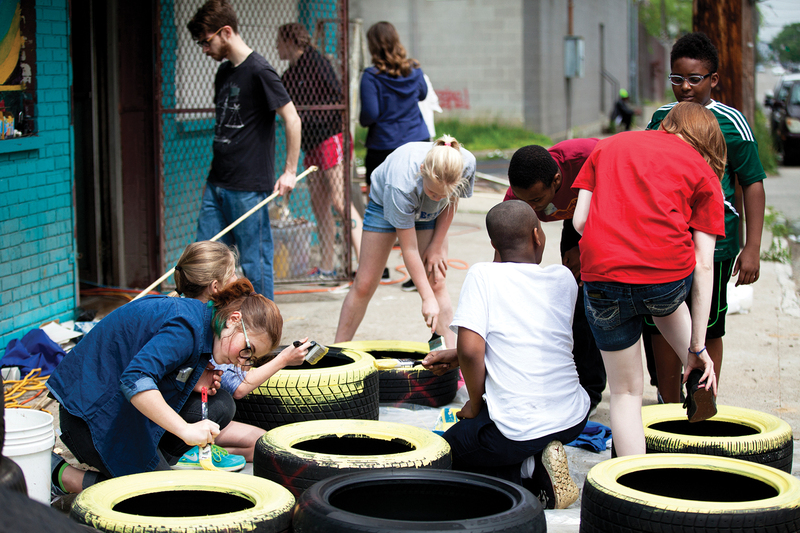 Steam Exchange youth and volunteers repurpose old tires found in the neighborhood to use as flower planters. 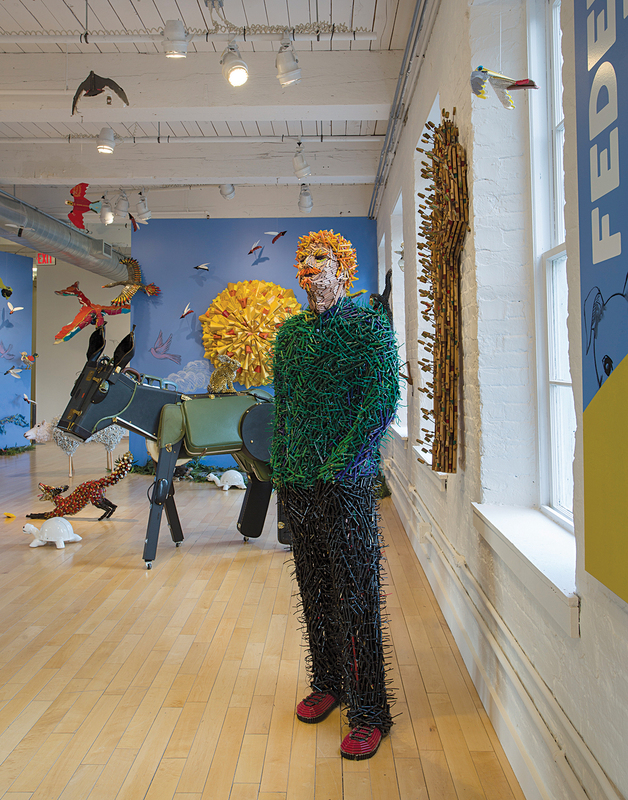 At MASS MoCA’s Kidspace, exhibitions encourage kids to look at life from new perspectives. For the show “Here Comes the Sun,” Federico Uribe used materials that often have negative associations and assembled them into entirely different forms. 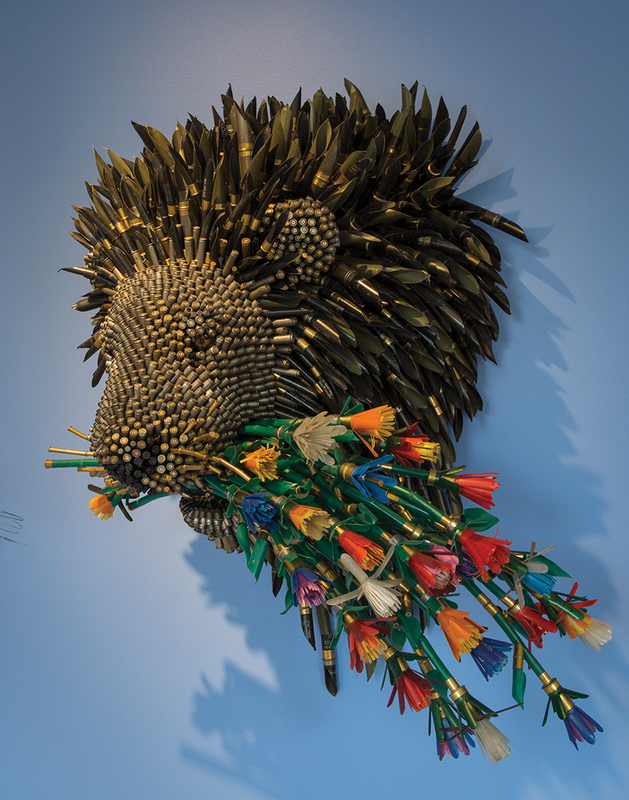 Federico Uribe's life-like lion, made of bullets, can be the start of conversations about difficult subjects such as violence. Jesse Fleming’s Mirror Mirror (2014) uses a call-and-response activity to create a connection between partners.